Rebecca Camhi gallery is happy to present the first solo show of Paul Desborough in Greece. The paintings of Paul Desborough challenge our most basic assumptions about the nature of painting. By being neither on canvas or panel, his works sever the conventional bond between medium and support to develop a new strategy of painting for our time and in turn to celebrate the physical materiality of the paint. The act of making the paint mark is preserved in its essence: unconstrained by framing edges, each paint-skin is stretched through space or over a surface, to activate and become one with its setting. By blurring with the boundaries of sculpture and installation the formal limits of painting are challenged afresh. Paul Desborough’s portable murals are not site-specific works: rather they are the means by which the site is conditioned. They take charge of the space they inhabit they activate the walls by breaking through their confining nature, engendering a spontaneous flow of colour, light, depth and thought. A close inspection of Desborough’s paint-skins – characterised by an intuitive instinct for abstraction combined with a technical facility in the classical tradition – reveals the presence of photographic images from consumer product packaging grafted into the skin of each painting. In his works the commercial aspect of the appropriated and embedded images is corrupted and re-individualised to serve as a platform for the interpretative reading of the work. Desborough’s intuitive pictorial approach to appropriated print media images unleashes the potential of narrative transformation: in the flash of awareness before conscious understanding we become aware of layered references, from which the impulse of new meaning self-generates. An exuberant pallet of venetian colour, a Baroque grandeur of scale, and a gravity defying lightness seemingly revel with the molten metallic edge of a rock-riff or cinematic sequence, to create a cultural fusion all its own: an aesthetic arena unconfined by the framing edge of categorisation – a pictorial space in which the most unexpected cultural synergies are brought into play to create a new narrative for the present. counter-culture rock-pop music and those band’s recording achievements, which he likens to his approach to image making. 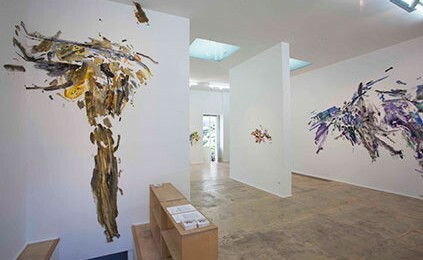 The exhibition entitled Misheard Lyrics presents a selection of Singles from his recent Albums – notably the Earlier Influences: works that fully reveal the artist’s refinement and control of a seemingly informal technique.